Classification issues arise as recent children’s titles push boundaries. Works that defy easy or obvious placement will always exist. But it appears with increasing frequency that publishers are opting for young nonfiction that embraces the kind of narrative, design, and style choices normally reserved for works of fiction. While efforts to make nonfiction more accessible and appealing to readers are always welcome, the blurring of fact and fiction is not. These nonfiction picture book hybrids, which often contain minimal information within the main text but fuller back matter, are likely to languish on the nonfiction shelf (because of their lack of usable research), yet they also fall short in quality in comparison to other picture book titles. Furthermore, young readers are unlikely to be able to discern between what is factual and what is a stylistic choice or extenuation on the part of the author. Works that offer dialogue without providing source material, portray events that historically can’t be proved or disproved, or don’t address this issue are not only poor in caliber but also potentially problematic. Consider Ramin Ganeshram’s A Birthday Cake for George Washington. SLJ’s early review raised the issue of the integration of hypothetical moments in a work that is meant to be ingested as nonfiction. The review points to Hercules’s response to Washington (“An honor and a privilege, sir.”) and notes, “Young readers without sufficient background knowledge about the larger context of American slavery may come away with a dangerously rosy impression of the relationship between slaves and slave owners.” While an older student may look askance at a scene like this, the intended audience for this work would likely not have had the educational groundwork to process this information and then question it. 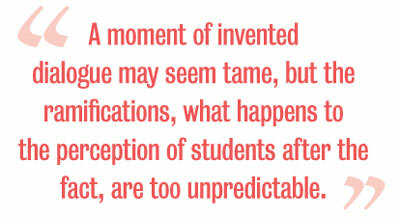 A moment of invented dialogue may seem tame, but the ramifications, what happens to the perception of students after the fact, are too unpredictable. However, this is not to say that all works of nonfiction cannot use storytelling elements in the service of fact or that the introduction of hypothetical scenarios may not have a purpose. It’s in the handling. Moving on from children’s to teen nonfiction, it does appear that authors take more time to discuss their research processes with YA readers and address where current scholarship is lacking concrete explanation. Sarah Miller’s The Borden Murders has gained widespread acclaim exactly because of Miller’s acknowledgement and exploration of the limits of knowable fact. It’s likely that these conversations flourish in teen books because of the age of the intended audience. But if an author or a publisher decides to approach a complex topic specifically for kids, due diligence (in this case, addressing what is story and what is provable fact) should not be sacrificed for the sake of style.